Managing files and folders is one of the most obvious—and easiest—chores to automate on your Mac, thanks to specialized tools like Hazel, as well as generalists like AppleScript, Automator, and Keyboard Maestro. I often want to quickly share a selected file in the Finder via Dropbox, by moving that file to my Dropbox’s Public folder and then obtaining the Dropbox link to the uploaded copy. So I created a Keyboard Maestro macro to automate the process. Yes, you can do this with the Dropbox Mac app, but that requires first moving the file into your Dropbox folder, then using the Dropbox menubar icon (or the Dropbox Web interface) to obtain the link. There are also some other third-party utilities that’ll collect Dropbox links, but I like the flexibility Keyboard Maestro gives to, say, chain multiple macros together—for example, so with one macro I can take a screenshot of the frontmost window then automatically put it in Dropbox. 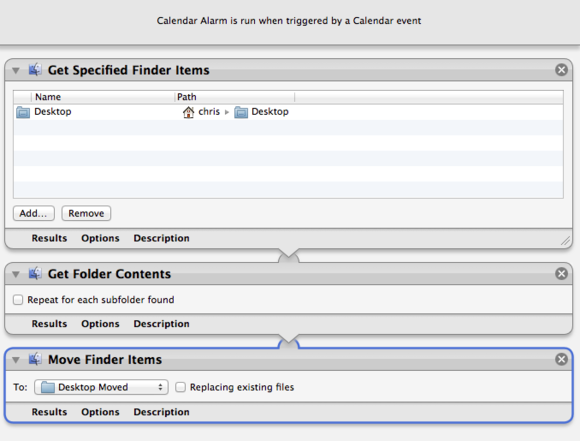 The first step selects the file, using the For Each action, specifying Path in the For Each drop-down and adding the collection The Finder’s Selection. 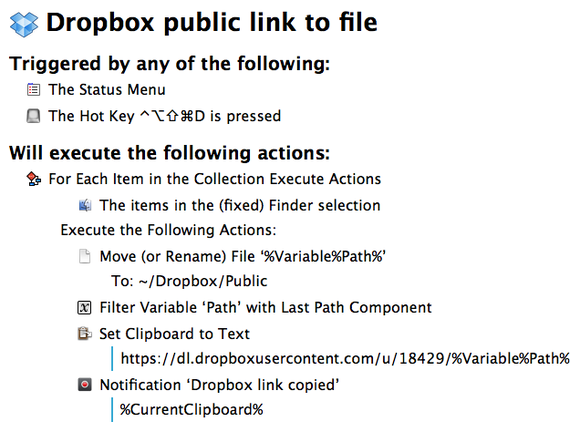 There follow four actions: Move (or Rename the File (opting to move the file %Variable%Path% to the folder ~/Dropbox/Public); Filter Variable to obtain just the filename (selecting the variable Path from the drop-down and Last Path Component from With); copying the Dropbox path to the clipboard with Set Clipboard to Text (setting Set to System Clipboard and To to Plain Text, then entering the path to your public Dropbox folder, followed by %Variable%Path%); and, finally, Notification (with the title Dropbox link copied, the message set to the token Current Clipboard). I use my Desktop as my primary inbox: When I save a new file, it goes straight to my Desktop. Then, at the end of the day, I review it, tagging and moving files as necessary. I use Hazel to make this easier, by having it color-code files according to how old they are. Specifically, I mark brand new files with green tags. When those files are two-days old, I swap in an orange tag. After one week on the Desktop, files get a red tag. Any red files that sit for more than two weeks get automatically moved to an archive folder, which I revisit monthly, unless I’ve manually applied a blue “protect” tag.